Taste test: These were some top-notch store-brand potato chips. The 5.5-oz. bag contained a large number of tasty, fairly thick and almost entirely unbroken conventionally cooked potato chips. There was a medium level of salt, but plenty of great potato taste. 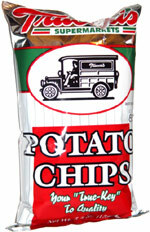 I suspect they might actually be Wachusett potato chips with Trucci's packaging. Smell test: Good potato smell. 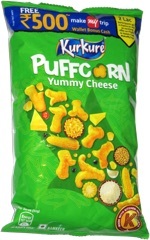 This snack was discovered by Jeremy at Trucchi's Supermarkets, Bridgewater, Massachusetts. Review published .